`The Gentle Giant' was a nickname coined for the mighty John Charles, but it was just as apt to describe Mark Jones, that seam of Yorkshire granite standing between marauding centre-forwards of the l950s and the Manchester United goal. Mark was the archetypal pivot, broad of beam, crushing in the tackle and majestic in the air. He was an uncomplicated sort of player and rarely ruined his ball-winning efforts by squandering possession with over-ambitious distribution. 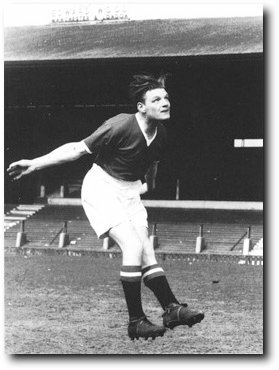 A simple pass to Duncan Edwards or Eddie Colman was his preferred option. The doughty stopper, who won two Championship medals with United, relished the physical challenge presented by such craggy characters as Nat Lofthouse and Trevor Ford, yet off the field he was a mild-mannered family man who had more in common with Clark Kent than Superman. Mark was a fellow without an ounce of malice and his gentleness was a byword. He liked nothing better than a natter about his beloved budgerigars, of which he was an avid collector, and reacted amiably to being dubbed `Dan Archer' by team-mates in reference to his pipe-smoking habit. His football life was complicated by a continual battle for the centre-half spot with Jackie Blanchflower, the best man at his wedding. First one looked to have it sewn up, then the initiative would pass to the other. The Irishman edged selection for the 1957 FA Cup Final, but by the time of the Munich disaster, Mark had regained his place and was playing the best football of his career. Even the slightest injury to either man would mean a lengthy spell on the side-lines because of the other's excellence, though respected contemporary pundits reckoned that Mark was perhaps the best long-term bet. The big, blond ex-bricklayer, a former captain of the England schoolboy's team, had joined United from Yorkshire junior football and turned professional in the summer of 1950. That autumn, still only 17, he tasted League action for the first time in a home victory over Sheffield Wednesday, but then faced a four-year wait for a regular place. Duly he emerged from the shadow of his boyhood hero, Allenby Chilton, who played an important and selfless part in the youngster's development, helping to iron out initial crudeness in the Jones technique. Thereafter Mark made steady progress, but was never to realize his lifelong ambition of playing for England. The nearest he came was a place on the reserves' bench, but had he not perished at Munich, then surely that elusive cap would have been his before long.